Say squirrels and you'd visualise a little, grey furry creature commonly seen jumping and running from branches of trees. But wait until you see this giant colourful squirrel, a native to India. The Malabar Giant Squirrel is an exotic species which has brightly coloured fur coats. They have a three-toned colour scheme of tan, rust brown and beige. Double the size of the regular grey squirrels, the Malabar squirrels measure upto 36 inches. 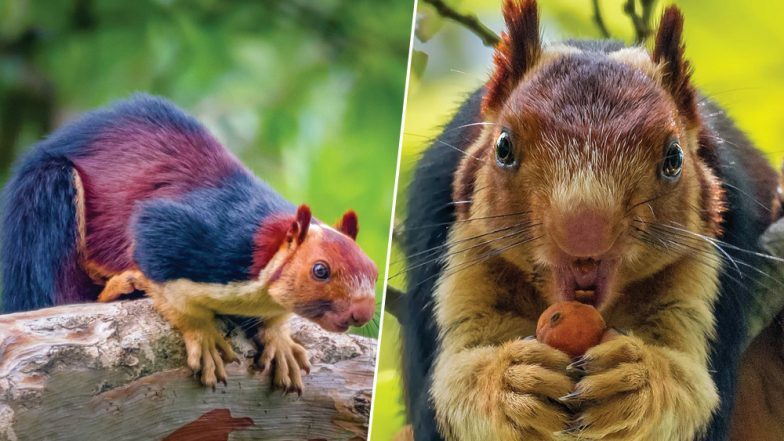 A few pictures of a Malabar Giant Squirrels scouting for food have been captured by a photographer and they are just spectacular. These close-up shots show the beautiful coloured fur coat of these giant rodents. Photographer Captures Squirrels for 6 Years and Gets The Cutest Photos of These Little Rodents. A photographer and nature enthusiast Kaushik Vijayan was lucky to capture these squirrels in their natural habitat. When he posted these pictures on his social media account, people were amazed. Talking about the love for his pictures, he was quoted in a report, "The response I see from the people on social media when I post a picture of the giant squirrels fuels my enthusiasm to go out there. It was when I shared some of the photographs on social media many of my friends and followers came to know about the Malabar Giant Squirrel and they were all amazed by its appearance." 2-Foot Tall Squirrels Caught on Camera in North Carolina, View Pic of Fox Squirrel. Aren't these squirrels beautiful? Their patchy fur helps them from being identified quickly in the jungles. Kaushik himself was surprised when he first saw this exotic species. And seeing the response on his pictures, he managed to head again to the jungles to capture them. He keeps on uploading pictures of them on his social media accounts. Fun fact: Endemic to India, the Malabar giant squirrel is the state animal of Maharashtra. Called as Shekru in regional language, these giant squirrels are also considered as a sign of good luck. They are found in deciduous and evergreen forests of peninsular India. They also found in Satpura hill range of Madhya Pradesh and Maharashtra. These are indeed among the most beautiful animals in nature.